The weekend has arrived, ladies and gents, and with it comes a spate of events and the promise of a little bit of something for everyone. The THUD-THUD of house music in a dark, smoky club? You got it? The kind of hippy music you’d be more accustomed to listening to in Sinai while wearing floral harem pants? You’ll find it – and much more. One of the biggest events of the weekend takes place on Thursday, as Theater of Dreams kicks off a new season with a new series in Cairo. Club Nights will take place monthly, with each night welcoming an international DJ and some of the best local talent. The inaugural edition is set to take place at Zamalek’s Venue Lounge & Bar and will be headlined by Brazilian DJ and producer, Sonic Future, as well as locals Baher and Abou Samra. 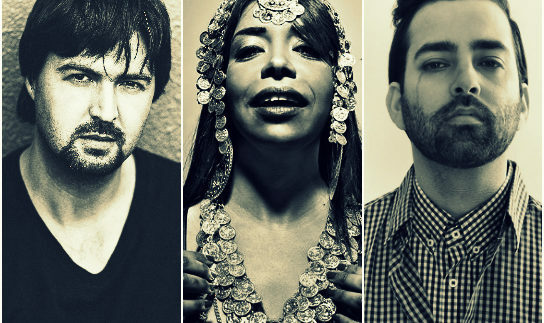 On the live music front, Cairo Jazz Club hosts a double header of performances, with Sufi singer and musician, Eslam El Sha'ary, returning on a night that will also see Kuwaiti-based artist, Zahed Sultan, playing his unique sound of alternative electronic sounds. Elsewhere, Garden City’s ROOM Art Space welcomes Kayan's Sherif El Shazly and Cosmic Architects' Mohamed Sa'eed Sheva for a night of acoustic ambient post-rock, while Ahmed Rabie – a man many credit for kicking off the jazz craze in Egypt – is set to perform at Cairo Opera House. Other highlight events on Thursday include Downtown’s Zawya kicking off a tribute to the late Mohamed Khan that will see the art-house cinema screen six of his best films across six nights, as well Johnny’s West welcoming back belly-dancing star, Amie Sultan. Friday starts bright and early(ish) over at Royal Club Mohamed Aly, where Nacelle hosts another edition of Funk N Pop, this week with the likes of local bands, Hawidro and Bluenotes, set to take to the stage, as well as DJs, Genial, Sewwes, Sherif Nakhla and Ramsi Lehner. Later on, progressive house DJ, Mohasseb, celebrates his birthday with a special night at Cairo Jazz Club and Aly B is the man in charge of Club Night at Zigzag, while versatile DJ, Man-O, takes to the stage at the Tap East, with rockabilly band, the Cadillacs, provide the entertainment at the Tap Maadi. The unique Sherine Abdo has been in fine form in recent times and her latest gig sees her perform at ROOM Art Space, while the Nubian-infused rhythms of Basheer will be ringing in the air at After Eight. Elsewhere, Zamalek’s Magnolia Leaves of Art is gearing up for a night of magic courtesy of Tamer El Badihy, while soprano-trained Mexican singer, Jessica Loaiza, takes to the stage for a special performance at Cairo Opera House. For something a little different, El Genaina Theatre hosts performances of musical production, Star of the Orient, or better yet, Maadi’s Osana Family Wellness welcomes one and all for workshops in Ashtanga Yoga and Backbend Yoga. Saturday is a little quiter, as usual, but there are still some mighty fine events rounding the weekend off, including one of the highlight gigs of the weekend, which sees French/Mexican/Egyptian band, Orange Blossom, take their unique blend of Oriental and electronic music to the stage. Elsehwere, Cairo Jazz Club hosts more live music, this time in the form of Al Mena and Sahra frontman, Ahmed Ezz El Ostool, while local band, Paranoid Eyes, pay tribute to Pink Floyd at Bab 18 Art Space. The Tap Maadi, meanwhile, welcomes increasingly popular duo of bassist, Samer George, and singer, Amy Frega, aka Voice & Bass, while the Tap East welcomes DJ Anis for a night of hip-hop. Gallery season has finally hit, meanwhile, with some of Cairo’s best keepers of art hosting new exhibitions, including Our Planet at the Shelter, Windows at Gallery Misr and Life in Motion at Ubuntu Art Gallery. One of the most interesting exhibitions, however, can be found at Zamalek Art Gallery, where a retrospective of the work of one of Egypt's pioneering artists, Gazbia Sirry, is on show. These are just a few events in what is a busy weekend – check out the Cairo 360 events calendar for more. Oh, and have fun, of course.